Buy a Solar Lamp Post & Turn Your Garden ON all Year ! Need a Garden Lamp Post Light that marks the Spot all Year, and doesn't cost the earth? 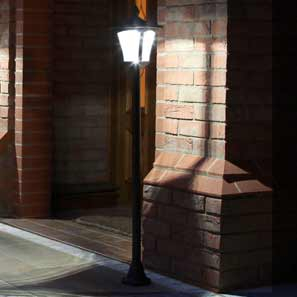 Welcome to the PowerBee Range of Elegant Outdoor Lamp Posts, designed to Light Up Your Garden All year long. PowerBee Solar Lights have been Tried and Tested over 10 Years, we design & select the very Best Lamp Posts that Work in the UK. Cast Iron Lamp Posts can be very expensive over £1000. But with Solar Power there are no running costs and no electrician is needed, its now possible to own a Classic looking Victorian Lamp Post that works really well in the UK for under £100!